Like other screen historians, I started gravitating towards performance as a way of studying early moving images and the machines that produced them. The deeper I delved into the lantern’s global history through eyewitness accounts of nineteenth-century magic lantern shows, the more I saw the lantern show as a vibrant, interactive, infinitely adaptable, and ever-evolving performance medium. 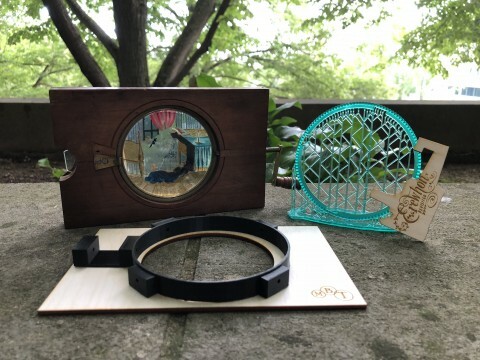 As an extension of my research, I began experimenting with new technologies to make magic lantern slides widely available for performing artists and lantern enthusiasts-- Carpenter and Westley’s copperplate-printed slides for the twenty-first century. Instead of brass and glass, the slides in Erewhon are animated by 3D-printed gears and laser-cut acrylic embedded in a laser-cut wooden frame. The most complex of these mechanisms is modeled after “the rat catcher”, a perennial favorite in Victorian lantern shows (see the Kent Museum of the Moving Image’s version in action here). The original slide contains three pieces of glass. On the stationary piece of glass, a man with a large black beard lies fast asleep. The man’s jaw is painted on a second, moveable piece of glass. One of the upper corners of the glass is secured to the frame so that the operator can move the man’s jaw up and down while snoring loudly. The final piece of glass contains one or more mice and is secured to a rackwork mechanism embedded in the slide’s frame. As the operator turns the handle, the glass with the mouse rotates, and the mouse appears to creep up the man’s bed linens and into his mouth. Spoiler alert: it doesn’t end well for the mouse. Much like their Victorian counterparts, Erewhon’s slides bear the fingerprints of many makers who combine artistry with technical expertise. When you look at the slides, you’ll see the handiwork Andy Webb who introduced me to Tinkercad, a free 3D modeling software, and helped me prototype early versions of the rackwork mechanism on UITS’s Ultimaker. There’s Ryan Mandell, Director of the MAD LABS, whose expertise in stereolithography resulted in more precise pins and diving components. Mat Whiteley, my laser-cutting hero, brought his background as a digital artist and animator to the slides. Jeremy Brooker (a celebrated lanternist in his own right) designed images that blended historic slide material with a few twists. You’ll see Kalani Craig, Michelle Dalmau, Adam Maltese, and the IU Makes community who tirelessly support of innovation in research and in the classroom through engagement with emergent technologies. Out of this community comes lantern slides that have not been made in 100 years. Incredible as the slides are, the magic of the lantern show is not generated by the slides themselves. If you’re lucky enough to experience Erewhon, you’ll discover that the true magic comes from the performers who bring these slides to life. Arthur Meek’s whip smart writing and engaging performance style invites us to see the technology as fellow storyteller by making the magic lantern and the iPhone part of the very fabric of Erewhon itself. Add to this Eva Prowse’s ethereal voice and synth soundtrack, and you get an adventure that is breathtaking, cleverly cheeky, provocative, and nothing short of extraordinary. 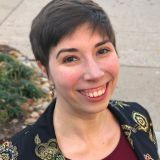 Mary Borgo Ton is a Ph.D. candidate in Victorian Studies and the Digital Pedagogy Specialist at the Institute for Digital Arts and Humanities at Indiana University. When not playing with 3D printers and laser cutters, she studies the global history of early screen culture through David Livingstone and other nineteenth-century missionaries who used magic lanterns while traveling abroad. Thursday, 02 August 2018 Lasers and plastics and slides, oh my!